The Humble Indie Bundle 4 has added an amazing bonus for anyone who pays more than the average purchase price: the Humble Indie Bundle 3. I'm starting to think that the Humble Bundle guys might be serious boozers. It's like they get together every few days, get all tanked up and then someone slurs, "I gots me an idear!" and everyone else goes along with it because, hey, they're bombed. How else could you possibly explain deals like the Humble Indie Bundle 4? The latest addition to the latest Humble Indie Bundle is nothing less than the previous Humble Indie Bundle. 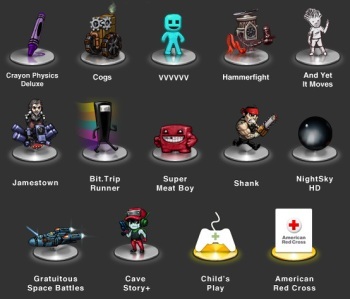 For those who pay more than the average purchase price, which currently stands at $5.16 - that's five bucks and change, kids - you get Jamestown, Bit.Trip Runner, Super Meat Boy, Shank, NightSky HD, Gratuitous Space Battles and Cave Story+, and Crayon Physics Deluxe, Cogs, VVVVVV, Hammerfight and And Yet It Moves, plus the soundtracks for all of them - HIB3 and 4 both. That's 12 games and 12 soundtracks, DRM free, for less than what you'd pay for lunch. And you can even throw the money at charity! It's madness! The Humble Indie Bundle 3 currently holds the Humble Bundle Championship Belt with $2.1 million in sales, but the HIB4 blew away the million dollar mark in just one day and currently sits at over $1.7 million with a full week of sales left. I think it's safe to say that the crown is about to be stolen.